While the economy continues to suffer, it is of great importance for home owners to save money at every opportunity. Our attorneys have helped lower property taxes for hundreds of Bucks and Montgomery county residents through the assessment appeal process. Our Real Estate Tax Specialists are able to lower your property taxes using our intimate knowledge of governmental tax regulations and property evaluations. The sooner the process is started the sooner we can save you money! Contact our office today at (215) 942-2100 so we can start your property tax appeal. We can quickly determine whether your property is over assessed and explain how we can begin the appeal process. Our process enables property owners to realize a great deal of savings afforded to them by the law. What is a tax appeal? The taxes that you pay for the property you own is based on the assessed value that the entire county is assigned by the governmental taxing board. The local, county and school taxes that you pay are based on the estimation of this assessed value. If this estimation is correct, you pay the correct amount of taxes, usually in your monthly mortgage payment. If this estimation is not correct, then more likely than not, you are paying too much. You have the right to challenge the assessment for your property on an annual basis and each county has a different period for filing an annual appeal. - In Bucks County Pennsylvania, the deadline for filing is August 1. - In Montgomery County Pennsylvania, the deadline for filing is September 1. Taxes are usually the single largest expense in any real estate operation. If you are a commercial property owner, you want to make sure you have the best tax plan in place. We offer general property tax law counsel to businesses and individuals who own commercial real estate in Pennsylvania. For example, we can help you develop real estate tax projections, draft tax escalation clauses in leases, and determine your eligibility for tax exemption and abatement benefits. Given the downturn in the economy and the softening of the real estate market, now is an excellent time to review your property tax assessment on all holdings, including commercial, residential and industrial properties. Our experienced Property Tax Appeal Specialist will work with leading professionals in the fields of appraisals and assessments to determine to what extent you are overpaying. We are able to use our intimate knowledge of the Property Tax Appeal process and legislature to lower your property taxes to their correct levels. This process can be lengthy and complex. It is important to have the finest representation in order to maximize your savings. Using various ratios established by the Pennsylvania State Tax Equalization Board and any changes in the market value, we streamline the otherwise complicated tax appeal process. 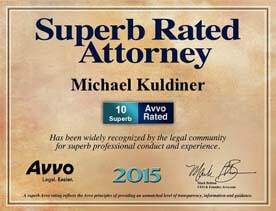 The Law Offices of Michael Kuldiner will aggressively represent your interests in court proceedings or county appearances in order to obtain the largest tax savings possible.